The purposes of the D-5 zone are to promote high-density development of commercial and mixed uses in areas that had been receiving areas for transferable development rights under Chapter 17 of the 1958 Zoning Regulations. The following Downtown Sub-Areas are found within the D-5 zone: Chinatown, Massachusetts Avenue Corridor and Mt. 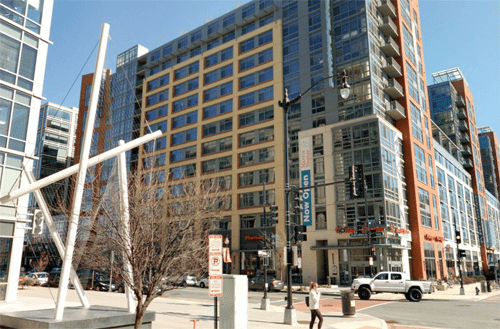 Vernon Square, Mount Vernon Triangle, North of Massachusetts Avenue (NoMA), M and South Capitol Streets, North Capitol Street Corridor. The D-5 zone is not subject to the Inclusionary Zoning provisions of Subtitle C, Chapter 10; however, a building in the D-5 zone may generate or use credits in accordance with Subtitle I, Chapters 8 and 9, which explains the credit system relating to Transferable Development Rights (“TDR”) or Combined Lot Development (“CLD”) rights. The permitted height of a building in the D-5 zone is based on the right-of-way width of the street upon which it fronts, as detailed in the table below. 2 A building with frontage on Mount Vernon Square or on Massachusetts Avenue between North Capitol Street and 15th Street N.W. shall be subject to the Massachusetts Avenue Corridor and Mt. Vernon Square Sub-Area.